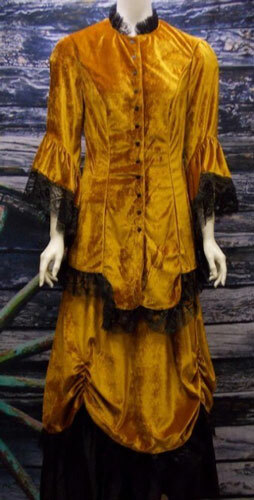 This Ensemble Features a Gold Velvet Top and Skirt With Black Lace Trim. The 12-Button Top Has A Fitted Silhouette With Neckline, Full Bell Sleeves And Shaped Bottom Hem Trimmed In Lace. The Faux-Ruched Skirt Offers A Comfortable Elastic Waist And Falls 40 Inches To The Hem. The Skirt Is Fully Lined With 100% Polyester Taffeta.